1973. It’s the first year of the venerable 1973-87 Chevrolet C-10, the longest running body style in GM’s history, and that truck set quite a few standards. 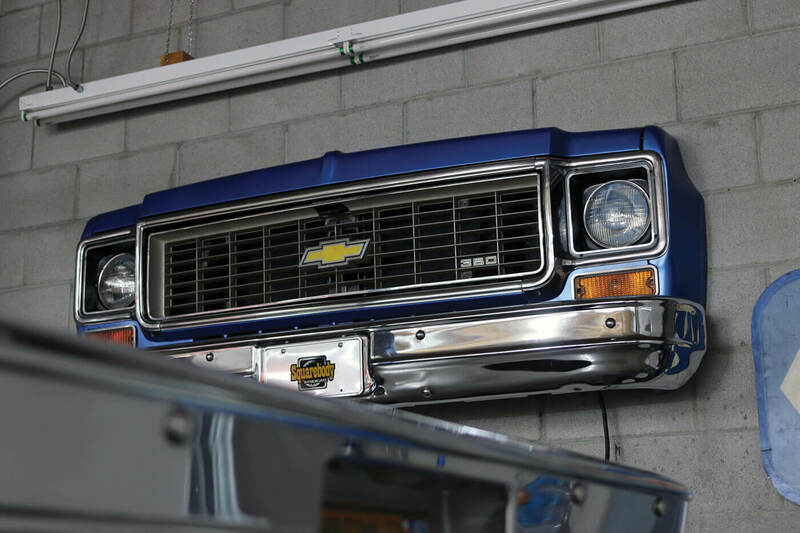 It was the first with wraparound taillights, a dually option that came out in later years, and it was the first GM truck with a factory crew cab. 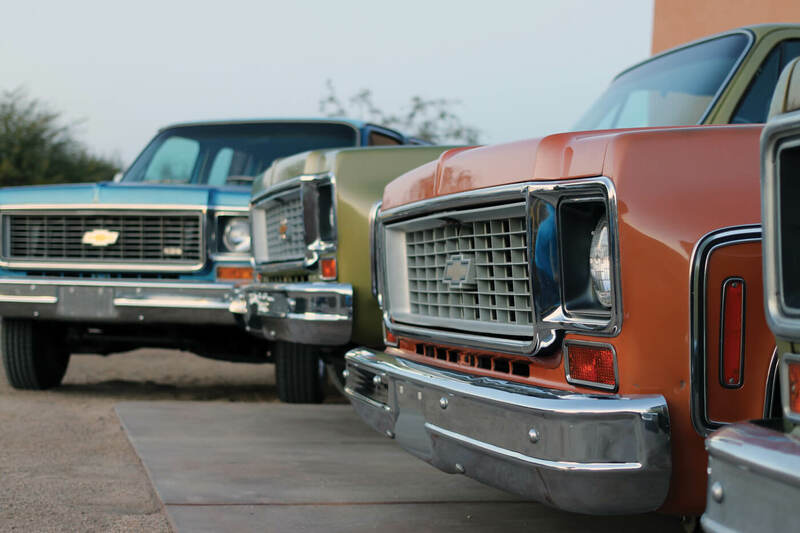 It also earned the moniker, “square body,” based on its squareish shape—which is ironic, because at the time, they were known as the “rounded line” generation by the folks at General Motors. All that is great, but to Joe Yezzi of Phoenix, 1973 is the only year that matters. That’s the same year as his father’s old long-bed GMC, painted Catalina Blue with the white roof and bumpers. The same truck he used to ride shotgun in when he was young and spending quality time with his dad. 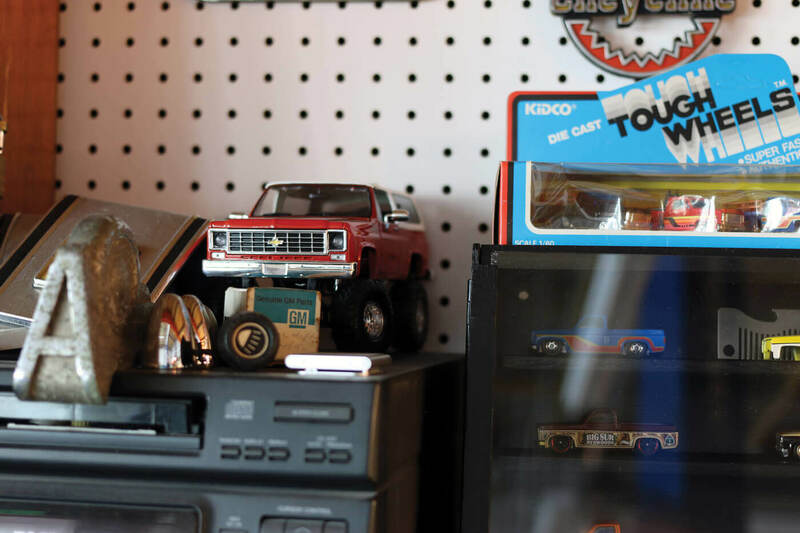 An old picture of that truck is displayed on the front of the paint cabinet in Joe’s workspace, pinned to the metal with magnets, a reminder of the good times. 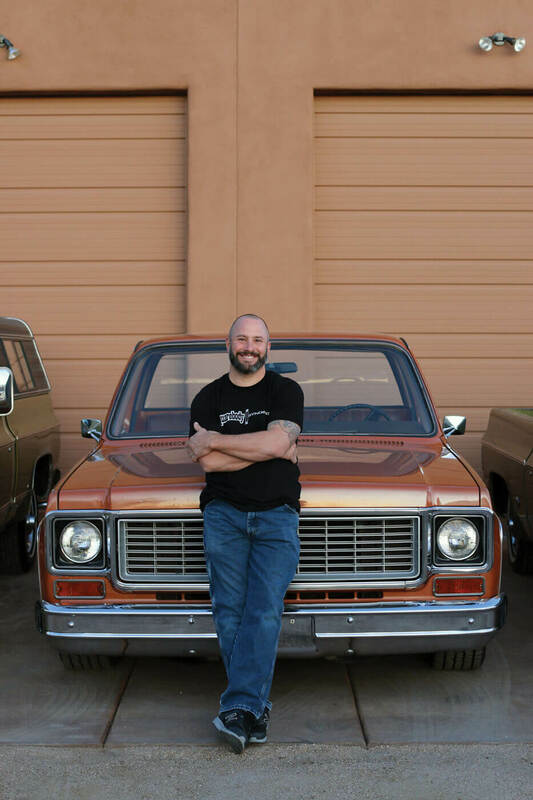 For Joe, the ’73 Chevrolet and GMC truck is the pinnacle of the truck world, which is why he started a business dedicated to the body style, Squarebody Syndicate. 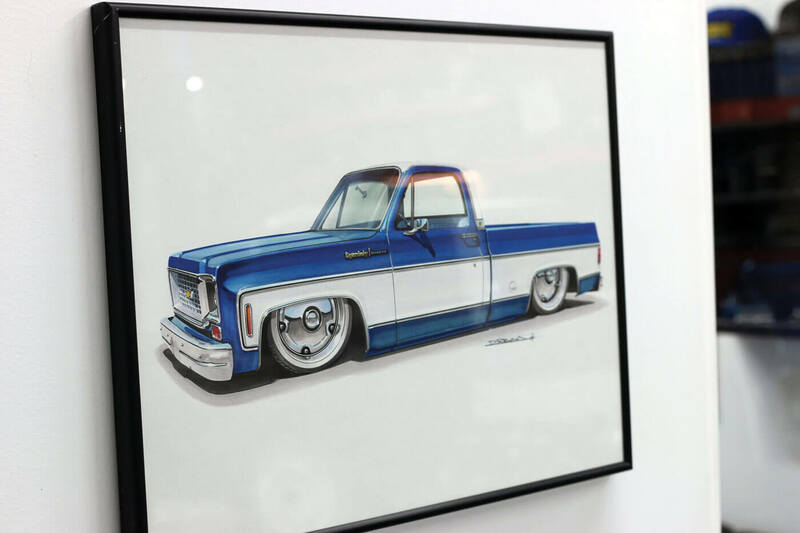 This rendering of his ’74 calls back memories of his dad’s GMC, complete with the two-tone paint job. You can’t turn around in Joe’s shop without hitting some kind of squarebody merch. Joe is a successful businessman, no doubt about it. He moved to Arizona from New Jersey in the ’80s, and once he hit the workforce, he started building an empire. 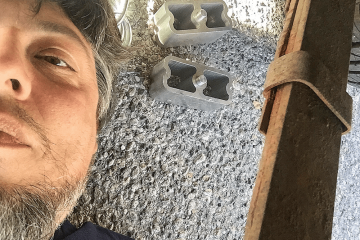 He currently owns two companies that specialize in concrete— YEZCO Concrete Polishing and Zonaco — that have done some high-profile projects, including the home of the Phoenix Cardinals, University of Phoenix Stadium. It’s given him and his family a good life, a nice home and stability. For most people that would be enough, and it was for a while. Joe built custom motorcycles for a few years, and also a Cadillac or two, which was another vehicle that his dad had in his stable. 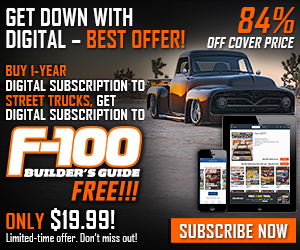 But after reconnecting with the square body a few years back, his obsession with the body style hit full force, and soon he had a passel of trucks to call his own. Most of the squares in Joe’s collection are ’73s and ’74s, but a few later models squeeze in here and there. Like most people today, Joe has his name on various social networks, including Instagram. He may not be a professional photographer, but you’d never know it, because the shots taken from his iPhone look spot on. It’s been a component in driving traffic for his business (reflections in polished concrete look amazing), and a hobby as well. One evening, Joe was hanging out in bed while his wife was taking a shower. 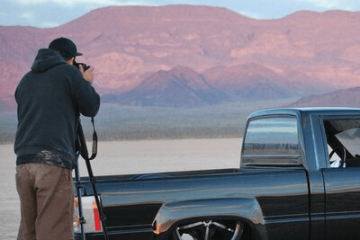 He was flipping through Instagram, looking at old trucks as he usually does, when the name came to him: “Squarebody Syndicate.” It not only referenced his favorite truck, but it also had an edge. Once a quick search on Instagram and the web for domains came up empty, he locked in the names and decided that this would be his next project. 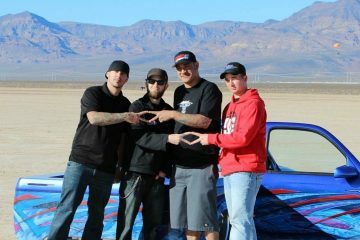 Squarebody Syndicate was official. Throughout the next few months, Squarebody Syndicate blew up online. Through the calculated use of hashtags and careful marketing, the brand became more and more popular. 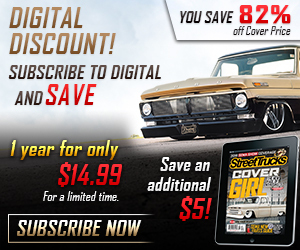 Soon it was popping up on TV shows, including The Discovery Channel’s “Fast N Loud,” during their own square body build. If you go digging through the Squarebody Syndicate Instagram feed, you’ll even find a shot of comedy legend Dan Akroyd sporting an SBS hat and shirt. The Squarebody Syndicate brand is built on the trucks, but Joe also has a unique vision for the products that he sells. Let’s take T-shirts, for example. If you buy a T-shirt from Joe, it’s made from some of the softest material you’ll ever wear. Better yet, the shirt you buy today will be one of only a limited run of that particular style; he’ll never sell that shirt again. To make that promise stick, Joe has designed numerous logos for the brand, all based on various years of the truck. There’s the logo that looks like the later-model years, based off the Silverado emblem on the fender. There’s another that looks like the badge that sits on the b-pillars, and yet another that is done in the same font as the original Cheyenne from the early ’70s. Plus, he also has a few surprise logos in the works, just to keep everyone on their toes. Some of Joe’s buddies have staked their claim on the lift in his shop. Plus, check out all of those SBS logos! He also carries other cool gear: hats, beanies and more, all of which are made using high-end materials. Joe wants his products to last, and he wants happy customers. By selling items made to his exacting standards, he’s fulfilling that promise in spades. Entering his shop is like walking into a GM dealership from the ’70s (but with polished concrete floors, naturally.) He has the sales albums for many of the production years of the trucks, complete with fabric samples. He even has dealer-only pieces that most consumers have never seen, such as a pocket-sized 1974 color swatch piece that only ever existed at the dealership. There are stickers that read, “Chevy’s Penny Pinching Pickup,” and the vintage posters that sit framed on the wall. 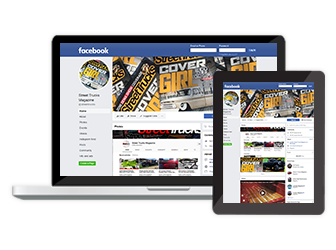 He’s actively looking to buy parts and gear at swap meets and garage sales, always looking for that perfect bit to hang up or sell to another enthusiast. Joe knows his squares, that’s for sure. Joe has owned quite a few squares throughout the years, starting with an orange and white two-tone model that he bought off a dealership lot after weeks of negotiation (the dealer didn’t want to sell it, either). Soon he was rotating through vehicles, buying long- and short-beds, crew cabs and everything else. He’s one of those guys that always has a project going with two more in the works. He’s also part of a growing crew of guys in Phoenix who build their trucks a particular way. 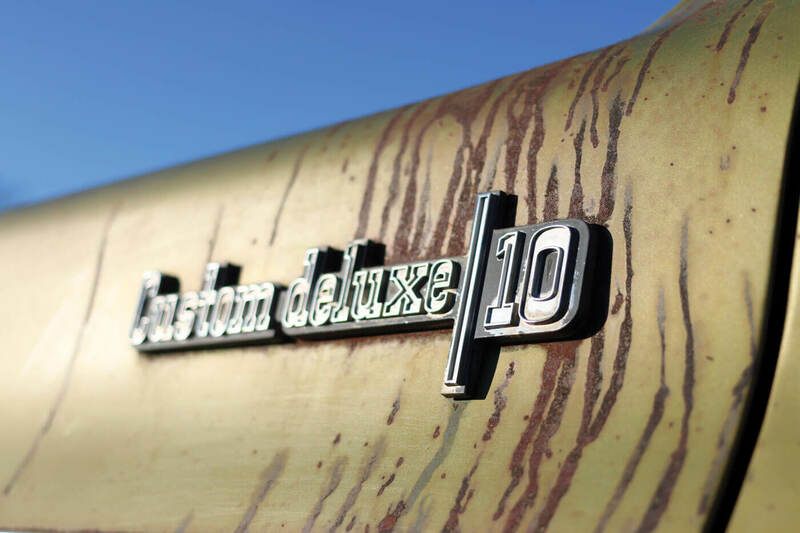 Many know of Dino Battilana, who was one of the first in the Phoenix scene to take the 1960-66 Chevy trucks to another level while showcasing the original patina. Alongside Dino is Nathan from Porterbuilt, Sam Castronova and, with a long-distance nod, Del Uschenko from Delmo’s Speed & Kustom in Burbank, California. 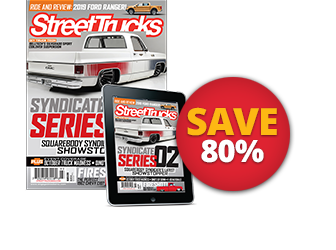 Although all of their styles vary, they’ve formed a group that’s tightly-knit because they all enjoy wrenching on old trucks. The original chassis from his 2015 SEMA project, ready to go under a yet undecided vehicle. Joe’s 2015 SEMA build WIP. 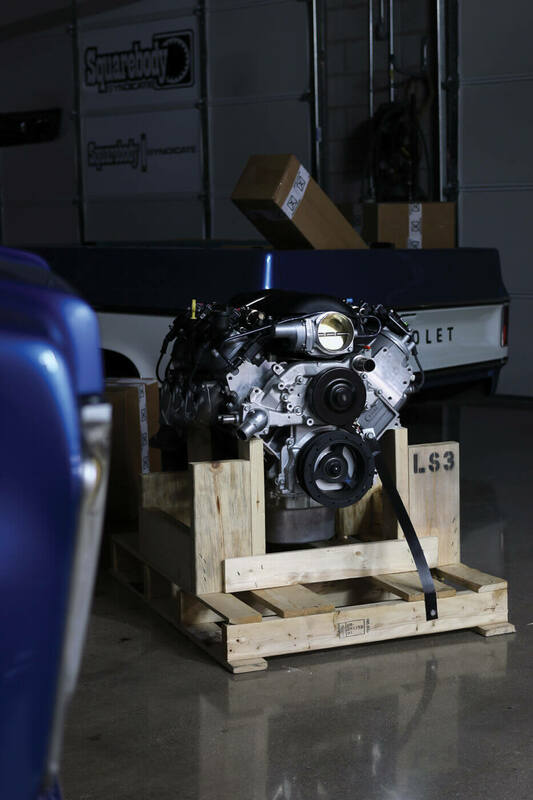 This LS3 will be part of Joe’s 2015 SEMA project. Expect Del Uschenko of Delmo’s Speed & Kustom to work his magic. For Joe’s part, he’s mostly into mild customs. He prefers buying trucks that are as stock as possible, usually with the original paint and options. Most of the time he’ll lower them mildly on some trick old school rims, possibly powder-coated white or something similar. For the most part, his fleet is full of drivable vehicles that are as reliable as a truck that’s more than 40 years old can be. Then there’s one of his latest builds, which is going another direction. Last year, Joe took his ’74 square out to the SEMA Show, all painted up and pretty. 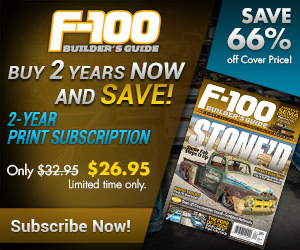 This year, he’s blown the truck apart while he waits for his new Porterbuilt chassis. 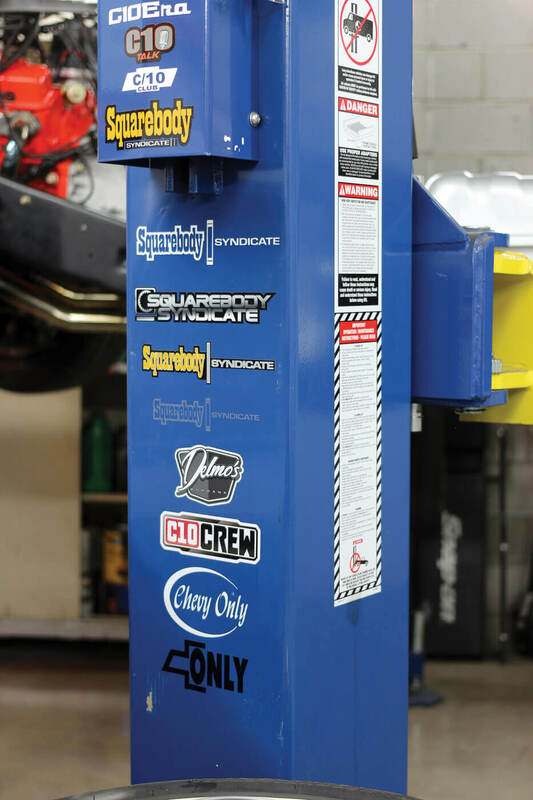 It’s getting the works, including an AccuAir setup and more, in preparation for the 2015 SEMA Show. 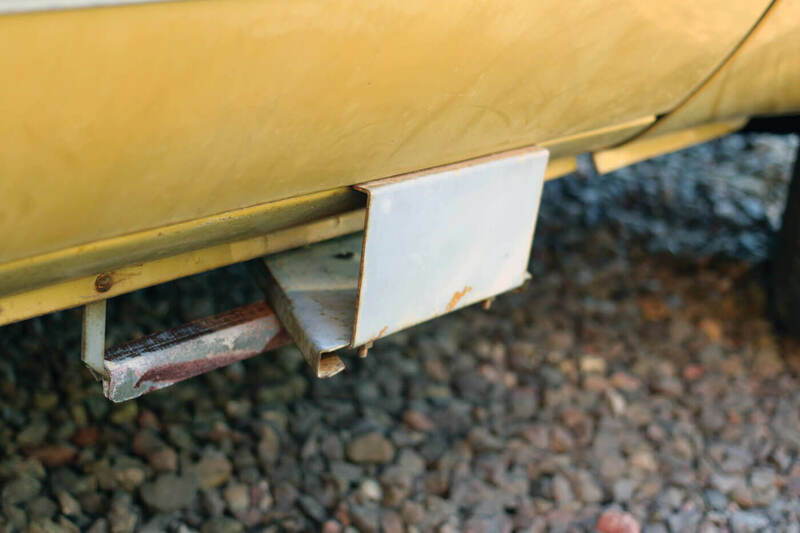 As for the old chassis, which is running a small-block V-8 with a mild lowering job, that’s likely going under one of his other projects, but which one it will be is anyone’s guess. The paint job for that 2015 SEMA build? Catalina Blue, or as close to that as he can get, with a white roof and two-tone. If there’s one theme that comes up again and again when you talk to Joe, it’s the concept of comfort food. For him, the squarebody Chevy is like that familiar home-cooked meal that mom used to make, or the food that you want to eat when you’ve had a bad day. These trucks remind him of days gone by, back when he was just a kid sitting next to his dad in his Catalina Blue GMC. Back then he didn’t have to worry about the types of things that adults think about all the time, like taxes and payrolls. Instead, the most important part his week was spending time with his pops, usually driving somewhere in that familiar truck. Even the way the smell of gasoline mixes with the factory upholstery takes him away to that simpler era, and every time it puts a smile on his face. His love of the trucks is infectious, just ask anyone who’s spent more than five minutes talking to him about it. With just a hint of a Jersey accent still detectable, he’ll tell anyone who will listen every odd fact about those trucks. For example, he knows that there was a recall on the earlier model trucks because the bed sides were rusting out prematurely. Chevy fixed them, but used a different color primer on the replacement parts. It’s OK to Joe if they’re rusty. He wants them as original and drivable as possible. 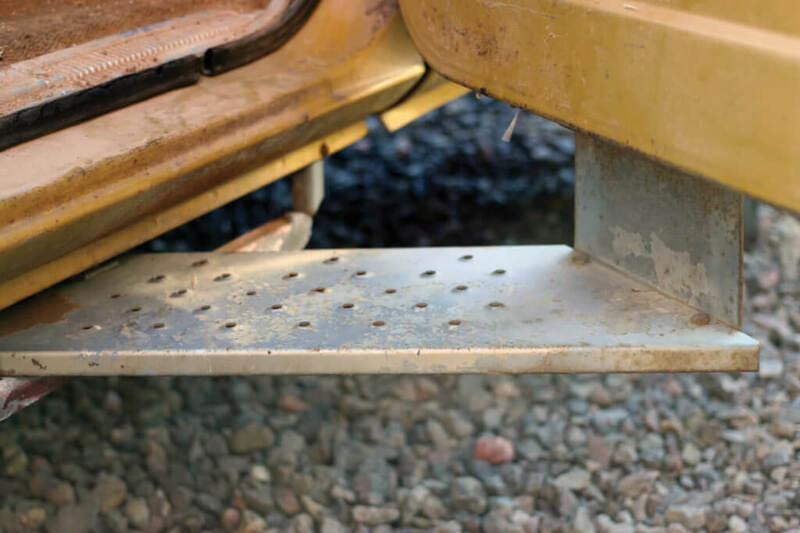 Some dealers offered this retractable step as an option back in the ’70s. It was only on the passenger side, and it mounted to the door and frame. Joe knows what each color means, and therefore, knows if that truck’s bed side has seen work before, and that’s just the tip of the iceberg. It’s that positive attitude that’s brought him this far in the industry, and he’s got nowhere to go but up. Come this summer, most of his friends will spend time putting the ’74 on that gorgeous new Porterbuilt chassis, wrenching away while smoking cigars and having a good time. Joe epitomizes what the custom truck spirit is all about, and he never forgets how grateful he is to be in a position to be able to have the time to build these trucks himself. Joe Yezzi in front of Squarebody Syndicate’s HQ in Arizona. At the end of the day, Joe’s taking the positive memories from his childhood and turning them into a business he can be proud of. If that isn’t the right way to do things, then we don’t know what is. If you’re interested in keeping up with Joe, follow Squarebody Syndicate on Instagram or check out Squarebodysyndicate.com.